Angels Landing in Zion Nation Park is one of the most, if not the most, exciting and exhilarating hikes in the park. The beauty of Zion stretches out along a restricted-rock-pinna with exciting drop-offs on both sides of the narrow path. The trail finishes at the high-land from where you can see the beautiful views of the magnificent mountains that enclose the park. The hikers can enjoy hiking the entire trail as they rarely find such enchanting route. This route can be enjoyed by beginner hikers and up to the most experienced hikers. Beginning hikers tend to find it more exciting as they have more to explore. The Angels Landing trail looks like a pinna-like mountain structures from the center of the main canyon. The trial takes 3-6 hours to finish. You are sure to enjoy the scenery along the way. 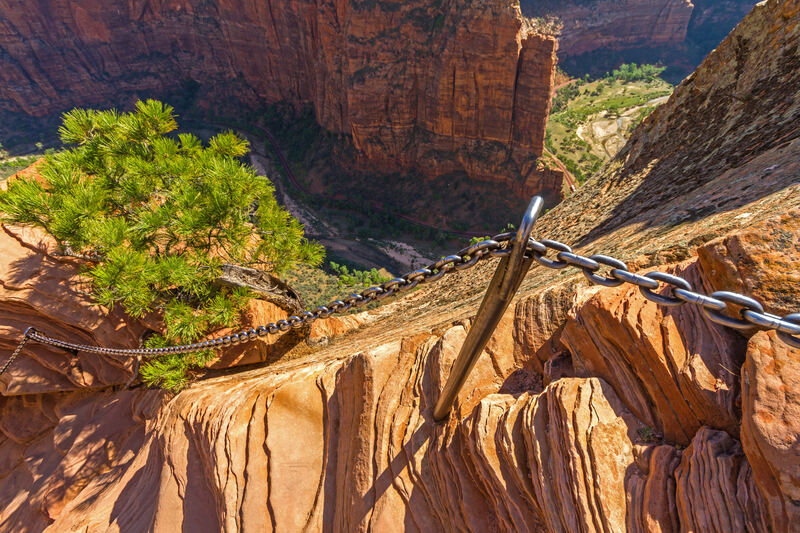 Rating: Angels Landing trail is rated as a moderately strenuous trail, it is advisable to people with a fear of heights not to attempt this trail. This trail is NOT for children, as they are not allowed onto the trail. Access Point: You can reach the trail from the Grotto Trailhead; located at the 6th stop of the shuttle. Time required: It takes 3-6 hours to complete the trail. Length: The trail is 2.4 miles from grotto trailhead to the angels landing viewpoint. Elevation: 1500 feet steep elevation gain. Ideal Hiking Seasons: You can visit the trial year-around. However, spring and fall are the most pleasing time to visit the trail. A word of warning if you visit during summer months, it can get extremely hot. Begin the hike from the Grotto Trailhead. To reach the trailhead take the Zion Canyon shuttle and get off at the 6th stop in the main canyon. Take the hiker’s bridge at the Virgin River and continue on the paved trail heading north until you reach the west side of the canyon. Once you reach the West Rim trail, the trail gets tougher and you have to climb steep uphill to reach the Refrigerator Canyon. This amazing deep hanging part of the canyon has temperatures that remain cool year round, hence its name Refrigerator Canyon. The steep climb continues a little bit more until you reach the Walter’s Wiggles Point, which is also famously known as 1930’s CCC engineering point. After climbing the top of the rim, in few minutes you will reach the viewpoint. At Scout’s viewpoint, you can see the canyon below. Enjoy the view of the West Rim Trail from the above viewpoint. The final segment of the hike is the most exciting when you walk on the narrow spine of the mountain and continue to climb another 500 feet in elevation. There are several uncovered sections along the path, so be careful when you are looking down at the canyon below. The trail provides chains and are protected with guard-rails with steps that are available for easy climb. You can also find resting areas along the way. Be sure to take a break when you feel tired. Don’t try to attempt this hike if you have fear of heights or if it is your first hiking, as you may get tired quickly. If you feel uncomfortable, then stop going further, don’t take the risk. Once you come to the final viewpoint, and the all the effort will be worth it. You will feel like you have conquered the trail and have an amazing sense of accomplishment. The view from the top is breathtaking. You can enjoy this 360-degree viewpoint, as you experience the amazing views from the top. You may meet some chipmunk friends here, but please do not feed them, as it is against the park rules. Take the same route to return to the lodge. The hike back down is less scary, and less strenuous. If you still feel energetic then take the West Rim Trail to view the breathtaking sceneries. Remember Angle Landing is a tough trail. Hikers who are strong enough to handle tougher tasks should only attempt this trail. This hike is not for children or those visiting the park with children. The records show that there have been some dreadful falls and people have lost their lives from the fall while hiking this trail. It is very important to follow each and every warning sign and rules when you are hiking. There are plenty of chances of rock-slide obstacles that hikers may face while hiking. It is very important to be safe and take hiking seriously. You need to be alert and aware of the dangers that could occur beforehand. Be careful, take it slow, and enjoy the hike. The best time to visit Angels Landing is definitely during the spring season and fall season, but, it is open year-round. It is advisable not to visit in summer months because the summer in ZNP is extremely hot. Where the summer is the peak season of vacations, if you visit the trail in summer, prepare to face crowded trials and extreme heat. Winter is a very unpredictable season and many trails will be closed due to heavy snowfall. You can get more information from the Visitor Center before you plan your hiking trip to Zion National Park. While visiting Angels Landing, don’t forget to take your camera as you won’t want to miss the amazing views ready to be captured. The trail offers outstanding views of this breathtaking scenery. Early morning is the best time to capture the beauty of the Angels Landing. Late afternoon you’ll also see the most interesting light shine through the canyon. If you are not scared of heights and in good shape for a strenuous hike, Angels Landing is the best hike to explore. It is a unique hike in ZNP that offers magnificent views from its viewpoint. Every time you climb the mountain you’ll find it more and more exciting as you continue to explore. Safety is the most important factor to consider for this trail. Be careful while you are hiking the toughest and more exposed sections of the hike. Drink a lot of water to keep yourself hydrated throughout the hike. Don’t ignore the warning signs. Watch out for the rock-scrambling obstacles. Take care and enjoy the trip.